PUT MILK IN BOWL. PUT IN MICROWAVE (2 MIN) UNTIL IT BUBBLES AROUND THE EDGE. ADD BUTTER AND CRISCO TO MILK AND LET MELT. ADD SUGAR. MAKE YEAST (FOLLOW DIRECTIONS ON PACKAGE). PUT EGGS IN BOWL AND BEAT UNTIL LIGHT AND FLUFFY. ADD SUGAR, CRISCO MIXTURE AND EGGS TOGETHER. ADD YEAST. START ADDING FLOUR A LITTLE AT A TIME. KNEAD UNTIL ITS NOT STICKY. COVER AND LET RISE UNTIL IT DOUBLES (WARM PLACE). 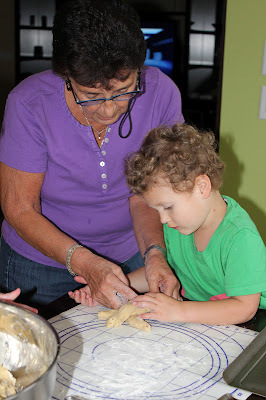 AFTER RISES TAKE 3 HANDFULS OF DOUGH AND ROLL THEM OUT INTO THREE STRINGS. BRAID TOGETHER. PUT ON GREASED COOKIE SHEETS. LET THE LOAVES RISE AGAIN FOR 30 MINUTES. ***MY OVEN 325 DEGRESS FOR 12-15 MINUTES. It's at the VERY top, the navy blue bar on the left-hand side. 5 pounds of flour, is that right?